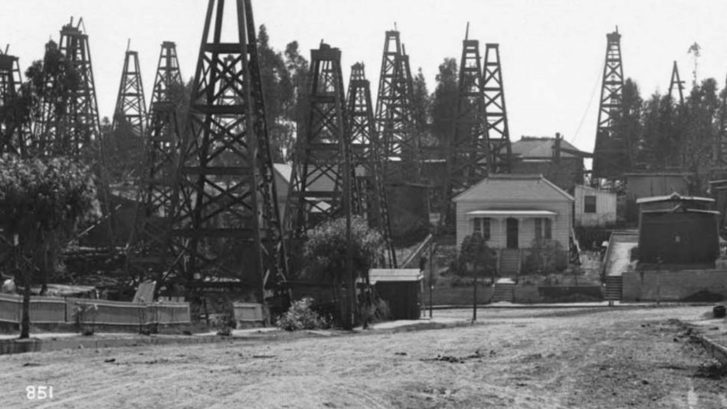 One can also say that LA oil drills gave way to new skyline views as well as the birth of environmental engineering. Long before becoming the epicenter for the film industry, Los Angeles was an oil town. Though few remnants remain today, a large oil field once cut a broad swath through the heart of Los Angeles, running from just south of present-day Dodger Stadium to Vermont Avenue in what is now Koreatown. It began large-scale operations in the early 1890s, before peaking at the turn of the 20th century and falling into decline as development encroached into its territory over ensuing decades. The photo (above) from the USC Digital Archive was taken near the intersection of Edgeware Road and Court Street in the first decade of the 1900s. It depicts oil production in the Westlake area near the era’s peak. Note the small home at 1274 Court Street at the terminus of Edgeware. The after image below, taken in 2018 by Laurie Avocado, shows this same view in a modern context. Gone are the abundance of oil drills, replaced by the skyscrapers of Downtown Los Angeles. The lone remnant of the century-old image is that same house at 1274 Court Street.